Hello there. I did not mean for my last blog post to come across so negative. I should have explained myself better as I well know that we all experience hiccups as parents and even though this one made me feel awful about what I did to Kyle, he is going to be fine. It happened, move on and don't beat myself up over it. It wasn't like I did it on purpose and it was mostly Anxiety Shife talking yesterday as I just went to DEFCON 1 imagining Kyle 20 years down the road discussing with his therapist why abandonment issues led him to an unfulfilled life as a whale feces researcher. I don't know about you, but I pictured motherhood as a big ol' sappy rom-com full of growth chart montages and fun, photogenic family trips to the park and nap times spent typing away on my laptop with heretofore unheard of bursts of creativity. I don't even think I included "showered every day" or "didn't cry once for a whole half hour" in my fantasy, because those were givens in my rosy, perfect life, in which the kitchen would overflow with bowls of ripe organic fruits, and poop would never accidentally get on my blouse. I hate to break it to you, but parenthood is basically the opposite of everything I just said. Of course there are plenty of amazing, beautiful, transformative moments -- but those generally take place when you are on the toilet by yourself. The rest of it is messy, both physically and emotionally. You will survive it, but it will not always be pretty. THIS IS NORMAL. Have a nice evening and talk to you tomorrow. 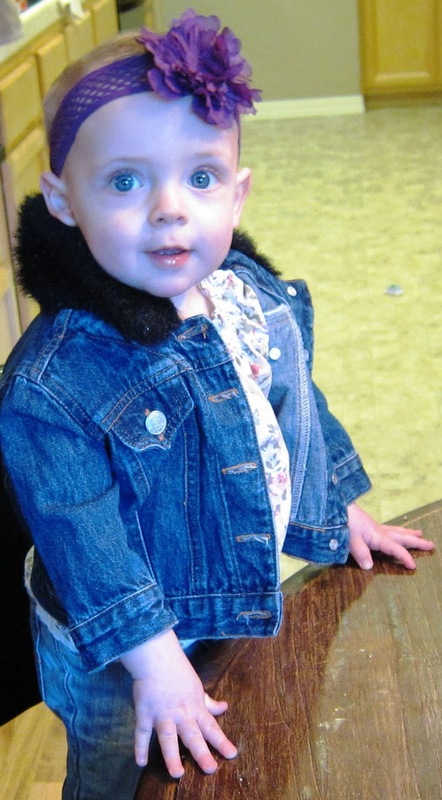 Little Miss Hayden being pretty in purple and her new jean jacket from her Great Grammie. I totally missed yesterday's post until now. I wouldn't feel too bad about it. We've been having some frustrating moments with our little guy the past few days. Yes, those beautiful moments can be less frequent than we realize, but it's what makes it all worth it. "How to be a Perfect Parent." Is there such an creature... lol. Sounds like a great book for all prospective parents to read. Even I might have gained some insight into the role. Does it cover the next few decades????? Miss Hayden gets lovelier every day. Do not handicap your husband by making his life easy.